Heaven received another angel. Elaine Feintuch, 86, of Bucyrus, died peacefully at her home Aug. 13, 2018, surrounded by family. She was born Dec. 10, 1931, in Fostoria, to the late Greta B. (Stephens) and Jacob K. (J.K. “Tommy”) Thompson. Elaine grew up in Tiffin, graduating from Columbian High School in 1949. A short time later, she met Thomas O. Feintuch while both worked at Ohio Power Co., Tiffin, where both her parents also worked. They married Sept. 3, 1950. Following Tom’s military service, they moved to Bucyrus, where Tom continued working at O.P. Co. and Elaine became a housewife and mother to two loving daughters. 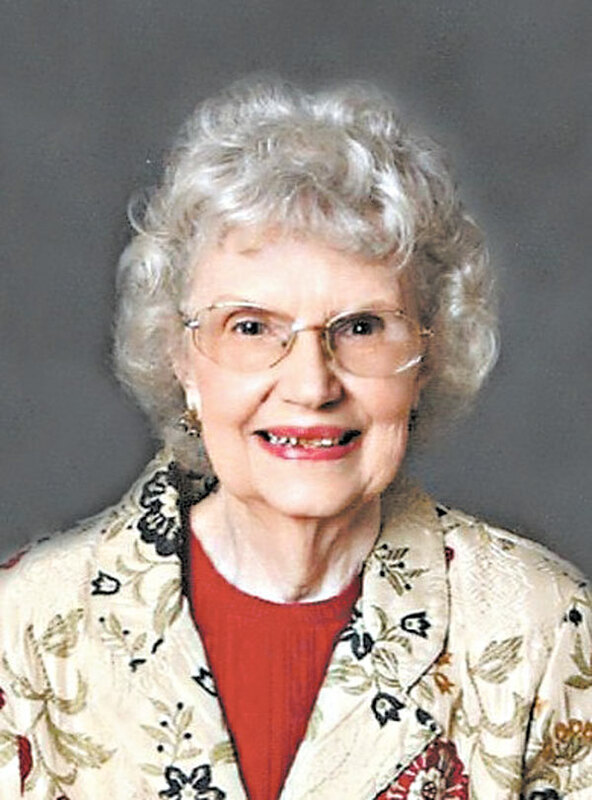 When her eldest was ready for college, she began working as a teller at Farmer’s Citizens Bank, a bookkeeper at Krauslock Olds & Cadillac, then as secretary at Epworth UMC. Elaine was best remembered for her beautiful singing voice and she performed many solos from a young age. She was a proud member of the Chancel choir for more than 50 years at Epworth. While there, she also was active in many women’s circles and served many offices including president for many terms. She also was choir director of the children’s choir for a couple years. Elaine found time in her busy schedule for a card club and to do several musicals at Bucyrus Little Theater with The Music Man and The Sound of Music among her favorites. She also could be found busy in her sewing room at home, making many of the clothes for her daughters growing up including clothes for their dolls and Barbies. She also was skilled at knitting and crocheting afghans and sweaters and later learned to decorate sweat jackets that she sold at crafts shows. She later helped her sister sell her dolls at Calico Angel Crafts Shows. Elaine liked to travel, whenever possible, with her family as they were growing up with several long weekend trips to neighboring state resorts, plus summer trips to either Sanibel Island, Florida, or their time share at Fairfield Glades, Tennessee. Later in life, she took several trips with close friend, Caroline McGrew, to many places including a trip to England, Ireland, Scotland and Wales. During her many trips she was able to add to her large collection of marble, glass and carved eggs that was started as gifts from family and friends. Elaine always had a love of animals that started with a toy fox terrier, Micky, and then extended to kitty cats after she was married. There always seemed to be a kitty or two during most of her life, ending with her kitty, Misty, grand-kitties Max and Milo, and loveable grand-dog, Kayla. She made sure the outside animals were taken care of too, by feeding the birds and squirrels in her backyard daily. Elaine is survived by one daughter, Laurie (Don) Nelson of Bucyrus, who took excellent care of her after her husband died; one grandson, Walker (Dawn) Mack; and three great-grandchildren, Olivia, Elijah and recent addition, Luke Mack of Chicago; one sister, Lois (Jim) Berger of Tiffin; seven nieces and nephews, Dennis Berger, Kathy (Kent) Zellner, Tom (Janice) Berger, Judi Berger, Sara (Alan) Sheidler, Pat (Kim) Doran and Mary (Matt) Jacobs as well as several grand-nieces and nephews. Elaine also was preceded in death by her husband, Tom of 54 years, who died in 2004; and her daughter, Melody Mack, at 29 years, who died in 1983. A private celebration of life gathering will be at a later date. Interrment will take place at Oakwood Cemetery. Donations may be given in care of Laurie Nelson through Wise Funeral Service, who assisted with Elaine’s arrangements. Memories and condolences are encouraged to be shared by visiting her tribute page at www.wisefuneral.com.